This Lent I won't be blogging daily but once or twice a week. I've produced daily posts during Advent and Lent for several years and I think this year it's time to approach things slightly differently. For me Ash Wednesday is a reminder of the transient and impermanent nature of our lives. There's a freedom in reminding ourselves that whatever is troubling us today will one day pass, and yes even a freedom in reminding ourselves "we are dust and to dust we shall return"; it should sharpen our focus onto the things which truly matter to us. 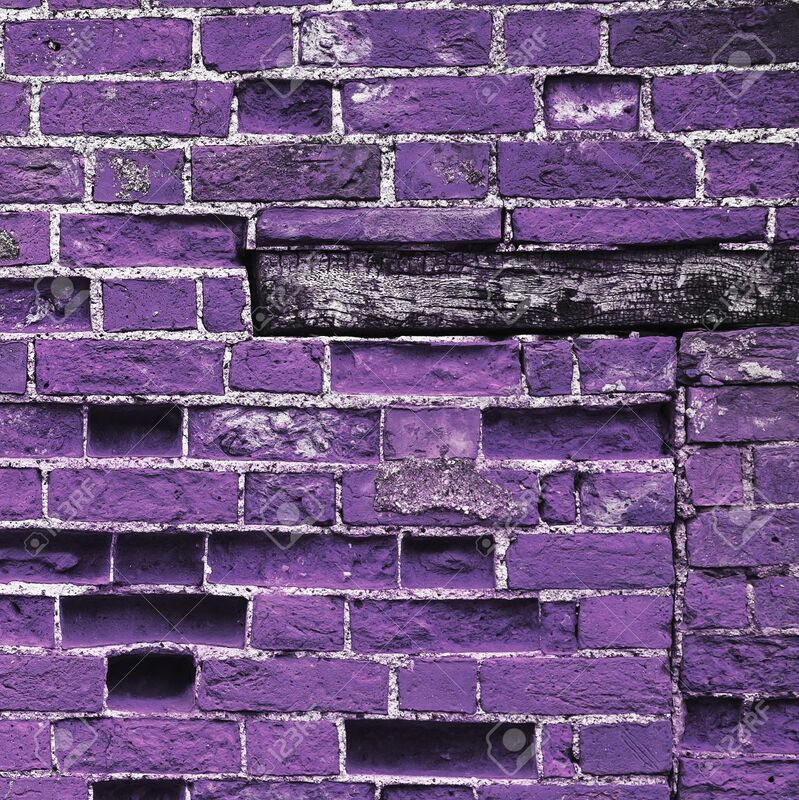 This Lent I'm using the Sacred Space Lent 2019 material. Today was a reminder that no matter what we choose to present to the world God knows our true selves, and loves us. I'm going to try and include music in my posts and what I'm sharing today is music I've used in several more sombre services including today's service with imposition of ashes. I thank my friend Tracy for introducing me to it. Have you ever experienced a storm at sea? It really is something. If I take us back through the time vortex 18 years Mike and myself were sailing back from Hamburg in a force 8 gale. 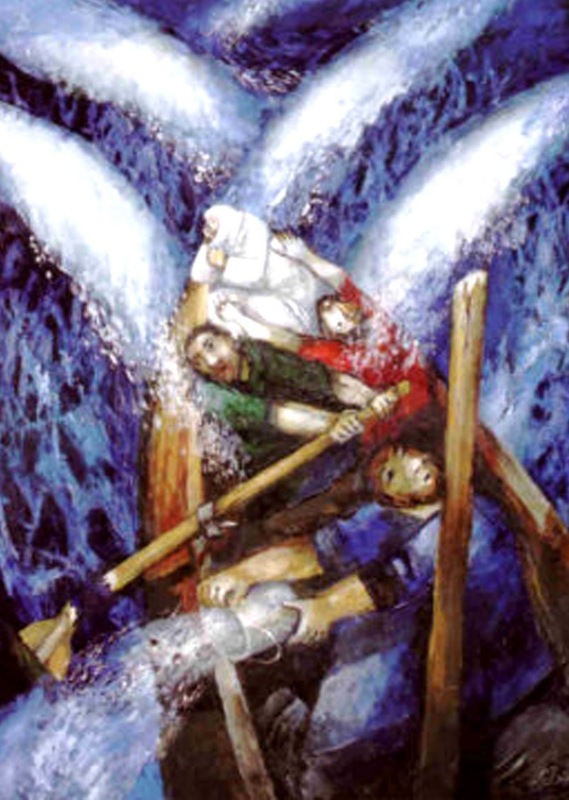 Now I say “sailing” and it sounds really rather quaint but we were in this great big ship which must have been worlds apart from what our disciples are experiencing in today’s gospel reading. We’d been woken in the night due to the rather vigorous motion of the boat and throughout the morning it just got worse and worse. It was a horrible feeling of everything being beyond our control, but it never really felt unsafe, the worst thing we had to deal with was some extreme motion sickness, particularly the group of 6th form students who’d been enjoying the cocktail lounge the night before. It never felt like we were in danger, it was a big sturdy ship and we trusted our crew to get us back to the harbour safely. Although I have to say that this is just who I remember the events, if I think back really hard I’m sure we must have encountered some of our fellow passengers who were really panicking and anxious, I’m saying I felt safe but I have no idea how anyone else interpreted the situation, how frightened or anxious they were. The sea and water, as we all know, can be deadly. It’s a metaphor we see again and again in scripture, particularly in the psalms and it’s interesting to look at the Jewish people’s relationship with the sea as a chaos which can envelope us or a darkness to be overcome. Yet the imagery of water in both the Jewish and our own tradition is very different- our baptism service is full of imagery of water as a power to cleanse and renew us- but there’s also the image of water as life-giving and sustaining, and of rebirth as the newly baptised, as Lexi will be today, are reborn to life in Christ. …And then with a few words from Jesus chaos reverts to calm, order is restored and those who’ve witnessed it are left asking “who then is this?” Jesus is rebuking the disciples too, which makes me feel really sorry for them. They know the water, they know they can be killed, but they don’t know, don’t really know, that this man can stop it with a word. Yes they’re amazed and yes they’re afraid. They’ve been confronted with the reality of who Jesus is and that is both wonderful and terrifying. If we travel back to the beginning of the Old Testament and the beautiful creation poem we see order coming out of disorder, God creating a world with a natural, created order, with rules – scientific rules of physics, biology and chemistry, although in creation there’re reminders that it’s still an ongoing process. Sometimes this still evolving planet gives us glimpses that chaos isn’t that far away; earthquakes, volcanoes, storms; we have better understanding than our ancestors of why and when these things can occur, but nothing in these seemingly chaotic occurrences breaks the rules of the world God has created. 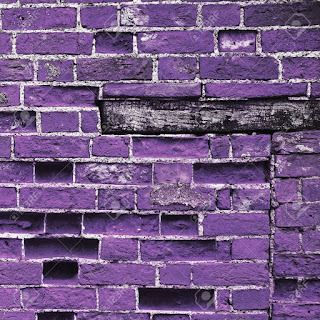 What does break the rules is Jesus. Any abstract ideas or beliefs, or any theories his followers had have now stopped being theoretical, they’re confronted with an overwhelming display of power that can’t be reasoned or rationalised. When any of us is confronted with the reality of who Jesus is, that he’s from God and is God, it has to change us. We can’t know and believe that and then be left unchanged; because if we believe Jesus is who he shows us he is, we have to believe in the things that he said and did, and if we believe in those things we have to start living them; and that’s not easy. It can involve a total deconstruction and reconstruction of our lives, motivations and principles. We can often feel like the disciples in the storm, overwhelmed by chaos, waiting for God’s intervention. Sometimes it feels like everything is out of control around us, and we look to see where God can possibly be in any of it and hope that God will calm the storm. Sometimes this passage is called the gospel for the overwhelmed, but there’s also a message there that God’s presence and intervention can be unnerving, as can the times when it feels God is napping during our own storms and crises. Right now, the world on many levels feels like it’s in a time of flux, a time of chaos, whether that's politically, environmentally or spiritually. It’s a time that we more than ever need to set ourselves apart as being a part of something different, of belonging to Jesus, living out the truths he’s demonstrated to us. More than ever we need to honour the truth of who Jesus is; by standing with the marginalised, stewarding creation, loving and welcoming radically and with our entire lives. So much is beyond our control, but this isn’t, and when we bring a child to be baptised into the faith of Christ, as Abby and Alicia have today, this is the faith we’re offering, which we offer Lexi today. Jesus asks “Where is your faith?” after the disciples witness his power. When we’re waiting out our own storms sometimes faith is all we have, and the knowledge that the gospel stories don’t end with “my God, why have you forsaken me?” but with God overcoming the very worst that humanity could do, and the disciples finally knowing, really knowing “who then is this”, and as we must be when we come to that truth, forever being changed by it. Nothing. No light, no time, no substance, no matter – the Voice was there. Before anything moved, mutated or mated, Jesus, God’s Voice, was there with God from the kick off. How come? ‘Cos Jesus, ‘God’s Voice’, is God. Before anything began, they had always been. Before there was even anywhere to be, they were there. Jesus got the name ‘God’s Voice’ because he just spoke and stuff started. From nothing to everything, sparked only by the Voice. There’s nothing that doesn’t have the phrase ‘made by Jesus’ stamped on it somewhere. His words were life itself, and they lit up people’s lives – his light could blast its way into the dingiest corner, and yet the people who preferred darkness still missed it. So God sent John Baptiser to raise Jesus’ profile: to lift up the Light. His job spec doesn’t exactly fill a page of A4 – it just reads. ‘Help people take it in and take it on’. Obviously, John’s not the Light: he’s just there to build expectation and commentate when the genuine article makes his entrance and starts lighting things up. And when he does? Bizarre! No one recognises him! He speaks them into existence, but they don’t recognise him or his voice. He arrives at the front door of his people, and most don’t even peek out of the spyhole to check. The few who take the risk realise who he is, open up and knock a meal together. To these guys he starts doling out adoption papers to sign them up as God’s children. Conceived by human passion? No, by God’s passion! So God’s Voice gets flesh, blood, skin and bone. He spends time with us; we hang around with him, get to know him, see what he’s like. And? As magnificent, as superb as you’d expect God’s only Son to be…and heaps more! God’s OTT gifts oozing from every pore: everything he does and says rings true. Sometimes a story is so familiar, so much part of us and our lives and we know it so well, that we don’t really hear it. sometimes we need the story rephrased to make it new, to remember how it felt for it to be new and unfamiliar. The Street Bible has none of the poetry of John’s gospel but something about it just cuts straight to the heart of the Gospel’s meaning. Through Advent we’ve been waiting, we’ve been preparing and we’ve been anticipating the birth of Jesus, and now it’s here. The big day. Yet the gospel tells us one thing; he was always here. He’s always been here. Before all things and after all things. He was always in creation, yet not until that tiny baby do we begin to perceive it, to understand it, to fully know it and fully know him. He always was, but in that outhouse, stable or shed- however you see it- he came physically, he came to be vulnerable and live our frail, yet remarkable, human life. We’ve seen the signposts throughout history and through the scriptures, that this would be the culmination of God’s continuous, creative love. God sent us the truest reflection of himself, a part of himself, and this reflection was a helpless new-born baby. What does this tell us about our God? Whilst there’re many things within scripture that are shared with other religions and traditions- such as the creation narrative and great flood narrative- no other tradition has a God who makes them-self this vulnerable. God wanted us to know him, recognise his constant presence in creation, his thirst for justice and equality and this was the way he chose to do it, to live among us- and remember Jesus lived his human life for 30 years before beginning his ministry. 30 years of ordinary, extraordinary human life, and it begins here. God wanted us to know him and he wanted – wants - to know us. This relationship has always been a two-way thing. The creator of all that is wants a relationship with you- with me- we’re not ordinary and we’re not insignificant because each of us contains a divine spark, the presence of the God is within us. The baby in the manger is the culmination of millions of years of creation, thousands of years of human narrative history and the pinnacle of the love God has tried to communicate to us throughout it all. As we step back from the enormity of that, we see a family, a new family. A mum, dad and a new baby. A very ordinary story in some ways. We see love and we see relationship. God came to us this way because relationship and connection are all that really matter. This Christmas, as we contemplate the mystery, the enormity and the overwhelming outpouring of love, let’s remember to connect and reconnect, to build and rebuild relationships, because our God is the reconciling, radical God of relationships. If we take our lead from the one who created us and chose to live amongst us, we see that this is what we created for, and this is God’s will for our lives. This gospel reading is something is rare and so magnificent that it makes my heart want to burst. Two named female characters are interacting with each in the bible. As a woman, to read this is so affirming and empowering. Only 86 women speak in the whole of the bible, and nearly half of them are unnamed, only 8% of named bible characters are women. It’s understandable that the bible has come to us in this form, it was formed in a patriarchal society where woman were essentially property and commodities, then we have two thousand years of male-dominated church life. And two thousand years of this story being interpreted through the male gaze. Now we each interpret things out of who we are and where we are, where we’re standing is our lens into the world but for so long women weren’t in a position to be scholars, teachers and theologians. This means that so much of our inherited church history, theology and doctrines have come almost solely from a male perspective. This hasn’t always worked out so well for us women. We’ve been taught that our place is second to a man’s; our needs, thoughts and feelings are second. This can be uncomfortable hearing in our modern, more liberal world but one which I think will resonate with the women of our community. In tradition this is the story of Mary meek and mild, obedient to God’s will, meeting her cousin Elizabeth, equally obedient, her only longing to be a mother. Two perfect examples of godly, dutiful women. But that’s not the story I see. The story I see is so much better than that. Elizabeth, the older cousin, has had to endure so much. Her worth in her society has been measured by her ability to bear her husband’s children, and she’s failed. She knows she is more than that, has so much more to give the world, but this is the role carved out for her and she’s been made to feel ashamed by it. Then, the miracle happens, after so long, and she’s terrified. She knows the odds, the risk to her own life and the child. Her age is very much against her. Mary is at the opposite end of the scale- a teenager expected to be a virgin for her husband on her wedding day. The whispers have already started, there’s something going on between her and Joseph, looks like the wedding might need to be brought forward if you know what I mean. I don’t seek Mary as meek and mild but ridiculously strong, she’s probably barely older than my daughter, she knew having a child might cause Joseph to abandon her and she would then have her community shun and shame her as an unwed mother. The narrative today brings these two strong, faithful women together, Elizabeth overwhelmed at the realisation that her teenage cousin is carrying the messiah. This young girl had the creator of the universe within her. In the orthodox tradition she is the Theotokos, God-barer. As Mary and Elizabeth embrace each other, their shared bond doesn’t leave them speechless as out of Mary’s lips comes one of the most powerful and enduring songs in all of scripture. She sings of God’s greatness, her own blessedness and of God’s thirst for justice and equality. In this we see why God would choose Mary to guide and parent his son. She knows God, understands God’s character and drive, she gets it in a way that the male priests, scribes and pharisees- those revered by society- never will. I also want to be clear that these women have agency in their stories. If they had said “no” to God it would have been very different. They knew that they were letting themselves in for some potentially very trouble times. So why did they do it? Because they trusted God, because they saw a bigger picture, and because if God thought they were capable of doing this then just maybe God was right. That had trust and faith. Women are still far less likely to push ourselves forward for promotions and pay rises, less likely to talk ourselves up, say what we’re good at, less likely to think “I can do that”. Men, statistically are more likely to wing it, take a chance, not sure if they can do something but they’ll give it a go. The still present gender biases in media, reporting, schools, our very conversations with each other still promote this. We tell a girl she’s pretty instead of smart, we tell a boy to be strong instead of saying it’s ok to feel. This is what Elizabeth and Mary do, they shine. They become the women, the people, God knows they can be. And this is what’s asked of each of us. God wants us- needs us- to shine; wherever we are and whoever we are, no matter what our gender. God tells Mary and Elizabeth they’re amazing and they don’t brush it off with modesty, they accept it and they own it. They believe in God and they trust God. And they change the world. The central Advent narrative that has struck me this year is that God is before all things, after all things and within all things. Each molecule of creation contains a divine spark, and that includes us, a spark that’s just waiting to be acknowledged so it can become a flame, and that flame wants to shine for all to see. So my friends, go and shine, be fabulous, be who God intends you to be in this world. It's amazing how quickly the seasonal anxiety can creep back in, despite yesterday's calmness. I worked all day today, still feeling ok, but when I arrived back home I became overwhelmed. The pressure we put on ourselves is crazy. My aim is to remain focused on the only thing that matters this season. Yes I have a jobs list to work through but I need to remember we're preparing to celebrate, to feast, to share love and friendship and to welcome God again. Lord, may my deepest good intentions lead to acts of love. Then the grieving I feel right now can be transformed into comfort and rest...Jesus, my friend, You are the highest humility. Give me a great love tonight. As Your birthday nears, give me rich gifts, and listen to me with Your unending compassion. I started today badly. There was so much I wanted to achieve but I had a four hour commitment to help with a Christmas-themed meditation labyrinth as part of the chaplaincy team. I rushed around taking children to school, making Christmas truffles and then getting myself over to the hospital. As I stood in the lift up to the area we were holding the labyrinth I was worried we were wasting our time and I prayed, very simply, for God to be present and to use this time. The experience was stunning. 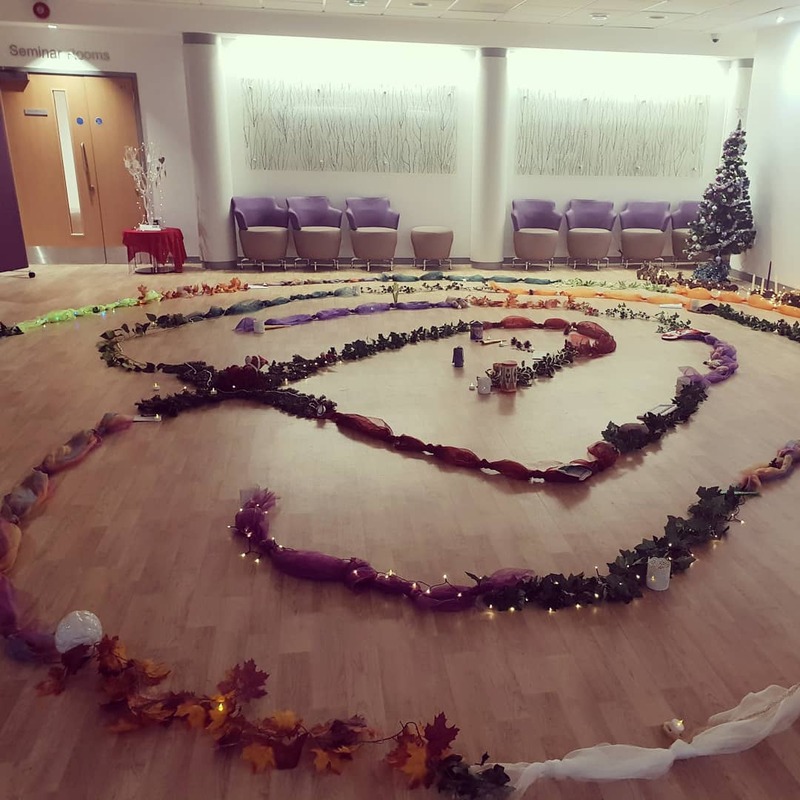 We had a steady flow of visitors, staff and patients, who engaged with the labyrinth and other mindfulness activities. As someone stepped onto the labyrinth they were told to do so with intention, the labyrinth is asking us "what do you want me to do for you?" as Jesus asks Bartimaeus. It took me a couple of hours to fix my mind upon what I wanted from the labyrinth, but it struck me that what I needed was peace and perspective, and that's what I received. I still get caught up so much in the "I shoulds" of Christmas that I still lose sight of the one thing thst matters and that's love, love divine, love so strong that the divine creator came to live a human life. Love, I love You because You’re full of joy! You’re a Mother nourishing the kindnesses in us as if we are children at Your breast (and we are). You’re rich beyond anything I can ever imagine. You’re so rich that the soul clothed in You can never be poor. You share Your every gift with us and even give our souls Your beauty because You make us one with You. St. John tells us that God is love, and anyone who lives in love lives in God, and God in them. There is something about simply sitting still, quietly attentive to your breathing, that tends to evoke less agitated, less thought-driven modes of meditative awareness. When this shift . . . embodies a sincere desire for God, a new capacity to realize oneness with God begins to emerge. Resting in this awareness offers the least resistance to God. With do few days left before Christmas day it feels like there's very little time for quiet and stillness. I need to finish presents, wrap things, finish sermons, work some shifts...it's a real discpline to remember to make space for God in all that, but if I don't then who am I actually preparing for? Today I was joyful to have brunch with friends, thankful that school holidays have arrived and helpless that I can't take stress away from the rest of my household.